Neptune, the eighth planet from the Sun, wasn’t discovered by telescope. French mathematician, Urbain Joseph Le Verrier, noticed that Uranus’s orbit was slightly off. He wondered if another planet lay beyond Uranus and caused the unusual orbit. He sent his ideas to Johann Gottfried Galle, an astronomer working at the Berlin Observatory. Galle located the planet in 1846, on the first night of his search. All about Neptune , the eighth planet from the Sun. Neptune is 2.8 billion miles from the Sun. Like Uranus, it has a blue color caused by methane gas. Scientists believe Neptune has a solid core, about the size of Earth. Neptune has a heavy atmosphere of gases, which gradually becomes liquid water and gas. 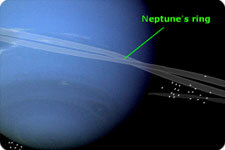 Neptune’s magnetic field is tilted sideways. This causes electrical disturbances and storms. In 1989, Voyager 2 found a large, dark storm spot that was big enough to engulf the whole Earth. 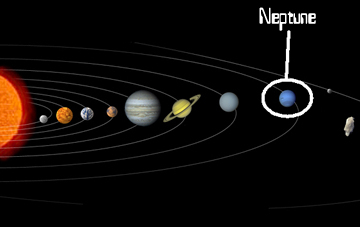 Neptune is the forth largest planet in our solar system, we could squeeze our Earth into Neptune up to 60 times. Triton, the largest of Neptune’s moons, spins opposite the direction of the planet’s orbit. Triton is the coldest spot found in the universe so far, with a temperature of – 391 degrees Fahrenheit. Geysers spew icy material up to five miles tall on this moon. Neptune has six rings and 13 moons, but that’s not all about Neptune. An educational video discussing about Neptune. Question: How long is one year on Neptune? Answer: One day is 16 hours and seven minutes, and one year takes 60,190 days. Question: How much would I weigh on Neptune? Answer: If you weigh 60 pounds on Earth, you’d weigh 52 pounds on Neptune. Enjoyed the Easy Science for Kids Website all about Neptune info? Take the FREE & fun Neptune quiz and download FREE Neptune worksheet for kids. For lengthy info click here. Declan, Tobin. " Neptune Facts for Kids ." Easy Science for Kids, Apr 2019. Web. 21 Apr 2019. < https://easyscienceforkids.com/all-about-neptune/ >.